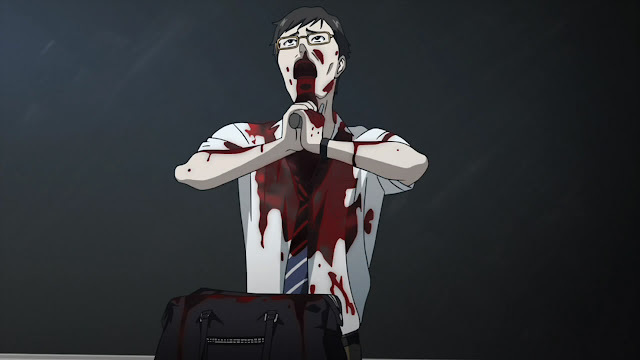 Another is the anime adaption of the homonymous Japanese horror novel. It is centered on the typical average generic run-of-the-mill schoolboy Koichi Sakakibara and his struggle against a curse killing his classmates and their relatives. 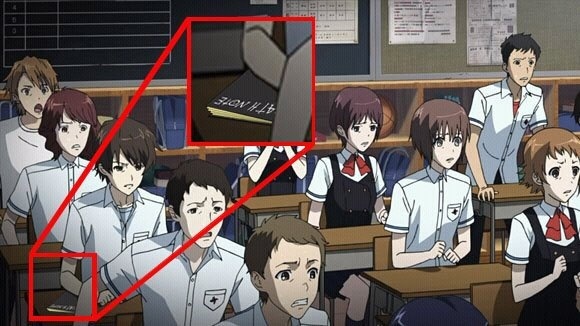 Luckily this anime draws out some interesting events and details out of this generic high concept plot, but nevertheless it is too single-minded to truly leave an impact. So students and/or their relatives die one after the other in gruesome scenes (the level of violence feels forced and unneeded though), culminating in an all-out massacre at the end. Was this scene really necessary? In the end, Koichi and Mei walk down a road together, and DON'T kiss or anything WTF, leaving the viewer (or in other words ME) severely disappointed. The merit of Another lies in its characters, most importantly the lead female. Koichi has few interesting character traits, he's the average clueless transfer student protagonists all setting and plot details are gradually revealed to. Other than Mei, Koichi himself is also played as the possible dead person in the early episodes. 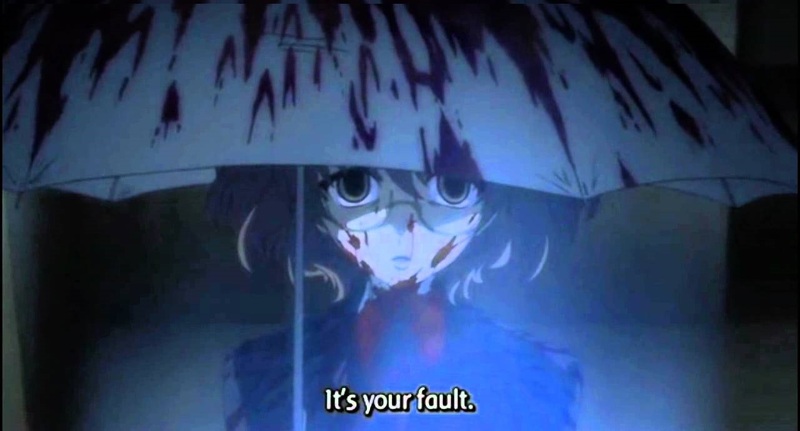 So, Mei Misaki, our Rei of this story. It's easy to see how Koichi would fall for her. She's pale, quiet, mysterious, very reclusive (and it doesn't help she is the one ignored by the rest of the class at the begining of the story), frail, and not very adept. At living. So, since she's not exactly like every other girl ever, a dream come true to have as a friend or even more! Oh, she also has only one eye. 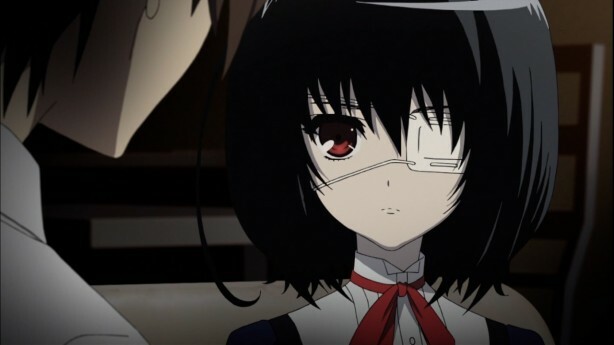 We later learn that her twin sister (also called Misaki, but in her case it's her first name) was the first victim of the curse - but despite having lost her beloved twin and only friend Mei isn't nearly as troubled and depressed as Rei is for some reason (I mean Mei is still troubled and depressed, but just not on that level). The dead twin reveal only happens late in the anime, but still this aspect - which is one of the rare things that is able to effect me emotionally - truly should have played a bigger role in this anime. Apparently there is a bonus episode focussing on Misaki and Mei's interactions, but I haven't seen that one yet. Once Mei gets off the class ignore list, her sheen does somewhat come off. It was clear from the beginning she wouldn't turn out to be the dead one (because too obvious), but she still was better as an enigmatic character than as just another (PUN) face on the group shot. There is one magic moment in the beach episode where an octopus grabs hold of Mei's arm and she gets scared for her life - as hilarious as this little moment is, it is also demonstrating clearly that the aura and purpose of the character has changed. So Another's selling point was to deliver a gory horror mystery, and it delivers on the gore part at least. Horror stories involving teenagers are not a particular novel genre, of course, nor are stories revolving around curses. Another is an extremely straightforward story, there is little room for any hidden meanings (yes, even if one character is at one time wearing a shirt inspired by a Dali painting). As the calamities decimating the class do sometimes involve random unrelated people (e.g. motorboat driver), the curse seems to be comparably powerful and could be likened to Light's tomfooleries in Death Note. Apparently, someone had had this thought before me. "Things are not always what they appear to be at first" is how Another could be summed up. Another was a pretty well made anime. I for one didn't care much about the horror plot or the bloodbath at the end, but your mileage may certainly vary in that regard. I certainly did get some enjoyment out of the character interactions, but there certainly was a lot more potential available in the scenario - just imagine if e.g. Misaki had been part of the cast and would have been killed only in the middle of the plot! Drama would have ensued! Tears could have flown (the policeman said)! Visual style and animation were pretty good. I definitely would watch another (PUN) season if one was made (which is extremely unlikely though).